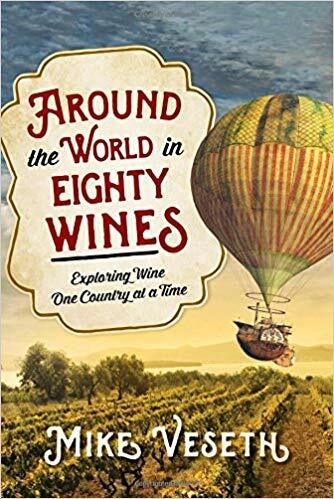 It takes a certain type of attitude to appreciate Mike Veseth’s Around the World in Eighty Wines, a personal exploration into wine that vaguely follows the conceit of Around the World in Eighty Days. Er, sort of. His general idea: Can we identify 80 wines that represent the entirety of the wine world, going region by region, as if it were a journey? Also there’s a hot air balloon on the cover. The book starts in London and heads roughly east, which means we get the big guns of France and Italy out of the way first. Veseth (a wine economist by trade) spends a few pages writing about the general grapes and wine styles of the region — acknowledging how tough this is in a complex region like Italy, then picks a few representative wines from the area as part of his hypothetical 80-wine cellar. It’s a tough task for such a short book. The regional stuff is quirky and quippy, very much on the surface no matter what region we’re talking about. You can’t really distill an entire region’s wine history down this far and have it all totally gel, and I think Veseth gets that. Portugal in nine pages? France in nine also? Most of the California stuff is spent either with bulk wine impresario Fred Franzia or on the touristy Wine Train in Napa. This is getting to the essence of an entire region? Of course, all of this is especially tight when you spend so much time writing about yourself. It feels like Veseth tries to work in a personal anecdote on every page, and damn if he doesn’t come close to succeeding. Sure, it’s a bit of fun to read a bit about winemaking in places like Indonesia, Syria, and Kenya, but these vignettes are short and, let’s be honest, irrelevant to most wine drinkers. And on the whole, as a true guide to 80 wines that define the wine world, Veseth’s instincts seem pretty far from the mark. By way of example, of the 80 wines picked in the book, six are from the U.S. (two of which are from Virginia). Five are from China. I’m not sure who the audience for this book is, but it’s neither the wine lover nor the novice, both of whom will find his picks real head-scratchers. In the end, it’s all just a bit too goofy to take very seriously, and maybe that’s what Veseth was going for: His day job as an economist is too dull, so he’s letting his freak flag fly here.